With a stay at Hotel Diplomat, you'll be centrally located in Tunis, a 2-minute drive from Carrefour Market and 8 minutes from Habib Bourguiba Avenue. This 4-star hotel is 8.8 mi (14.1 km) from La Goulette Beach and 0.7 mi (1.1 km) from Tunis Zoo. Pamper yourself with a visit to the spa, which offers massages, body treatments, and facials. Additional amenities at this Art Deco hotel include complimentary wireless Internet access and concierge services. With a stay at Hotel Le Pacha, you'll be centrally located in Tunis, within a 10-minute drive of Carrefour Market and Habib Bourguiba Avenue. This hotel is 8.5 mi (13.7 km) from La Goulette Beach and 0.4 mi (0.6 km) from Tunisia Private University. 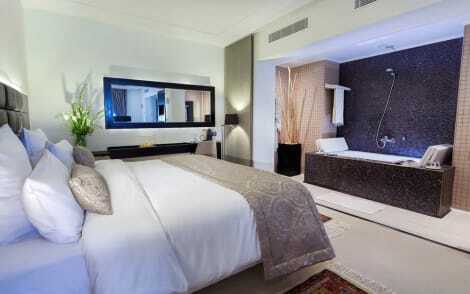 Make yourself at home in one of the 61 air-conditioned rooms featuring minibars and LCD televisions. Rooms have private furnished balconies. Complimentary wired and wireless Internet access keeps you connected, and satellite programming provides entertainment. Private bathrooms with bathtubs or showers feature hair dryers and bathrobes. Located in Ariana, The Penthouse Suites Hotel is within a 15-minute drive of University of Tunis El Manar and Tunis Zoo. This 4-star aparthotel is 5.5 mi (8.8 km) from Habib Bourguiba Avenue and 6.2 mi (10 km) from Bardo Museum. 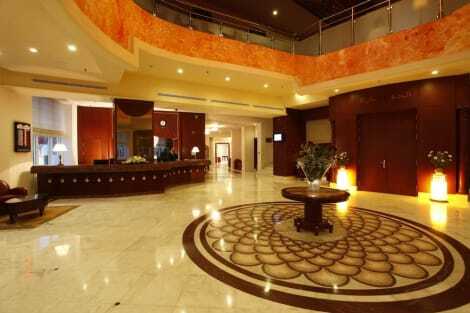 A restaurant, a business centre and meeting rooms are available at this hotel. Free continental breakfast, free WiFi in public areas and free self parking are also provided. Other amenities include dry cleaning and a 24-hour front desk. Located in Tunis (Bab Bhar), Business Hotel Tunis is within a 10-minute walk of Carrefour Market and Habib Bourguiba Avenue. This 4-star hotel is 7.8 mi (12.6 km) from La Goulette Beach and 0.7 mi (1.1 km) from Rue Charles de Gaulle. Relax at the full-service spa, where you can enjoy massages, body treatments, and facials. If you're looking for recreational opportunities, you'll find a health club, an indoor pool, and a sauna. Additional amenities at this Beaux Arts hotel include complimentary wireless Internet access, concierge services, and babysitting/childcare (surcharge). Make yourself at home in one of the 30 air-conditioned guestrooms. Rooms have private balconies or patios. Complimentary wireless Internet access keeps you connected, and satellite programming is available for your entertainment. Bathrooms with showers are provided. Make yourself at home in one of the 170 air-conditioned guestrooms. Satellite television is provided for your entertainment. Bathrooms have shower/tub combinations and hair dryers. Conveniences include phones, as well as desks and blackout drapes/curtains. lastminute.com has a fantastic range of hotels in Tunis, with everything from cheap hotels to luxurious five star accommodation available. We like to live up to our last minute name so remember you can book any one of our excellent Tunis hotels up until midnight and stay the same night.